I had my first whole day off in more than 3 weeks! And I was still sick. So it wasn't quite as fun as I was hoping. I was feeling too lazy to do my hair so luckily it was raining most of the day. I could use my umbrella to shield my very messy hair from the public. The only pair of me-made pants I own. Still haven't hemmed them. I wear them so rarely that it kinda doesn't seem worth it. I made the grey and purple top last year. I wear it a lot - at home. On Monday I finally finished the neckline on it so now I can wear it outside too. Still sick. I stayed in for most of the day. Hanging out in my pink and green pyjamas and my grey and purple crop top again. Doesn't it look better backwards? I got given the fabric for free at a fabric shop in Istanbul! I would have made it longer but i used basically every scrap I had and pieced it to squeeze it out. I was trying to tidy up my flat but ended up pattern drafting and sewing instead. Making hot pants! And I have ideas for skirts! Started the day with a swim. First exercise in almost a week! Then in the afternoon I went to work. There is a new security guard. Man can he talk! At the end of my shift I went to update him on the late arriving guests. 25 minutes later I was still there! I haven't repeated any outfits yet this month! Nor any dresses! I am quite proud of myself. 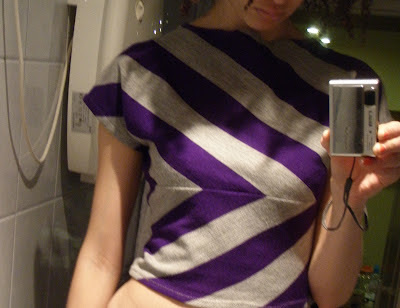 The grey and purple crop top is my favourite.